Although Crema is a single entity and we are often in agreement (at least broadly) on beer-related matters for this post we each wrote our own answers. As you might expect there was a great deal of overlap in our responses. Chris wrote the post and Emma added thoughts where some clarification was required. Probably worth clarifying from the outset that Chris works part time at Weird Beard Brewery. Chris: I’ve not had that much cask beer this year that has blown me away but it’d be hard to beat Weird Beard Dark Hopfler, though Hit the Lights is always a solid choice. Chris & Emma: Magic Rock Cannonball for sheer drinkability and an almost sure choice anytime we find it on draught. An honourable mention goes to Brewdog’s Dead Pony Club as a beer that we go back to time and time again when we want something low ABV and refreshing. Chris: Thornbridge Halcyon. Great to see more and more of this coming out of Thornbridge’s Riverside brewery and I’ve tried to get a case from every batch they’ve brewed this year. It’d be great to have it as a fridge staple at home in 2015. Emma: Even though I’ll fight anyone who claims to be a bigger fan of Halcyon than me, if you say ‘best bottle or can of 2013’ to me then I only have one answer: Gamma Ray in #cans. How excited was I about that event? SUPER CRAZY EXCITED. I vividly recall going to Duke’s straight from work on a Monday afternoon and delightedly pouring Gamma Ray into my face straight from the can. So eye-wateringly dank and even though the beer was a super face-melting overkill on the hops, it was everything I had hoped it would be: a great example of something truly living up to the hype. Since that day I’ve enjoyed cans of Gamma Ray as train beers (thank you, Sourced Market), and in bars where I’ve pointed them out to the staff because they didn’t even know they sold them, and as a staple in our beer fridge. Chris & Emma: Brasserie Dieu Du Ciel!/The Alchemist Moralité. There’s been some of this about at Brewdog bars up and down the UK but nothing beats the night we both tried to drain an entire keg of it at the Brewdog Clapham Junction Meet The Brewer event. Can’t think of a better overseas draught beer we’ve had all year. However, we wouldn’t be surprised if an Italian brewery occupies this slot next year (see below). Chris: Birra Del Borgo Rubus. Shared a bottle of this with friends at the Great British Beer Festival (frankly the overseas beers, especially the Italian and American beers, were better than the British offerings) and loved it so much we bought another bottle, which we shared this past Saturday. An absolutely stunning beer that shows where the Italians are heading. Emma: Special mention for cans of The Alchemist Heady Topper because it was part of an interesting IPA tasting panel we did at home comparing UK and US beers and it was great to experience a super hoppy beer explicitly designed to be consumed direct from the can. If I had frequent access to this beer I’d drink a lot of it. Chris: Magic Rock/Lervig Farmhouse IPA. Perhaps not the most stunning beer of the year but certainly the most consistently enjoyable. However, an honourable mention goes out to Magic Rock/Siren/Beavertown Rule of Thirds, which I wasn’t sold on when I had it at the launch at Beavertown but from a bottle a few weeks later, it tasted incredible. More please. Emma: On the day of Magic Rock’s Unhuman Cannonball release this April the beer people talked about the most afterwards was that Farmhouse IPA. I enjoyed how the character of this beer changes with age too, more bitter when it’s really fresh, then milder and sherberty, then later more, well, farmhousey – a marvellous mosaic of a beer. The Rule of Thirds has definitely grown on me. I was unsure how I felt about it on launch day, there was something muddled about the flavour... however, when we had it from a bottle on subsequent occasions there was more clarity and sharpness to it. I’m definitely a fan now. But if I had to choose a single collaboration beer of the year it would be the Weird Beard/IMBC black saison with Seville orange: Hacienda. So many black saisons are gimmicky and the darker malts don’t even add anything to the finished beer. Too many saisons that are ‘flavoured’ with fruits are either imperceptible or overwhelming. I love the darker roasty malts with the bittersweet orange underneath and in the finish the (subtle) yeast character. This beer, with a little time to settle and mature, became a highly drinkable, incredibly well-balanced beer. Chris & Emma: Magic Rock Cannonball. The availability and consistency has increased rapidly and we look forward to the day we can have it at home more. An honourable mention goes to Summer Wine Brewery for their superb Mauna Kea Hawaiian IPA that just blew me (Chris) away with its fantastic tropical fruit aroma and flavour after a very long day in the brewery (on Emma’s recommendation). Chris & Emma: There are two winners. Firstly Magic Rock for their eye catching branding that always draws our eye when arrive at the bar. Secondly, Nick Dywer’s artwork is a defining style for Beavertown’s fantastic branding but the label for Bone King was on another level. Best thing we’ve seen all year (it helped that the beer was damn good too). Chris: A dishonourable mention goes to Brewdog for going backwards and switching to a bland, corporate branding that smacks of the breweries that they railed against in the past. Chris: For a sheer explosion of creativity and range it’s a close run thing between Buxton and Siren, with the Derbyshire crew, led by bearded genius and all-round awesome guy Colin Stronge, just edging it. Notable highlights include Axe Edge, Ace Edge, Wyoming Sheep Ranch, Rainshadow and the superb Double Axe. Siren have produced a fantastic range of beers this year with their Discount series, Americano, Shattered Dream, the barrel aged Broken Dreams and the mango punch to the face that was the Tickle Monster. Emma: We all lost out heads a little bit over Double Axe this summer but I was a fan of Buxton before that. One of my favourite beers at IMBC 13 was their white wine BA saison, but I struggle to think of any of their beers that I haven’t really enjoyed or at least liked between then and now. I had an epiphany with Siren this year. Having found them hit and miss in 2013, we happened to stop into the Craft Beer Co. on Leather Lane for a drink one Saturday afternoon in spring. In the space of an hour I completely changed my mind after trying Shattered Dream, Americano and Ratchet. Then the Discount series consolidated that decision. Chris & Emma: It has to be To Øl. Some highlights from 2014 included Sur Mosiac, Hundelufter Bajer and Sort Maelk plus the countless collaborations with other breweries. We expect more greatness from these crazy Danes. However, an honourable mention goes to Brasserie Dieu Du Ciel! for producing stuff that goes blows our minds when we drink it. Chris: Brewdog Shepherd’s Bush for sheer variety of beer available on both draught and in bottle, served in fantastic condition and with the textbook example of how customer service in pubs and bars should be done. Emma: Same, for the best customer service in any beer outlet in London. Pretty much everywhere else that sells beer could learn from them. Chris & Emma: Mother Kelly’s in Bethnal Green. A relaxed atmosphere with tasty meat and cheese platters, and possibly the best range of bottled/canned beers in their fridges. The only criticism would be allowing people to sit and drink along the entire length of the bar. When it gets busy it’s a pain in the arse having to lean over people to order, pay for and pick up your drinks. Take a look around town and see how many other bars allow people to occupy the entire length of the bar, thereby blocking access to people who want to buy drinks. Can’t think of anywhere off the top of our heads. Chris & Emma: No contest. It’s IMBC as we already described in our previous blog post. Chris & Emma: Waitrose. We don’t buy much beer from supermarkets but when we do, it tends to be from Waitrose and their support of the Thornbridge home brewing competition this year showed their commitment to innovation and independent breweries. It is a shame the distribution of the award-winning beer wasn’t a bit wider. Chris & Emma: Bottledog . It never disappoints with the range of beers available; there will always be something you love or something you want to try. Honourable mentions to Beermoth in Manchester on the basis of our single visit during IMBC for an eclectic range and engaging staff and to Sourced Market in St Pancras Station for supplying train beers on so many occasions. Chris & Emma: this has been a difficult one for us. Compared to 2013, when we ordered a lot online, we’ve significantly reduced our online beer ordering in preference to buying beer in person. Largely because we’ve found it’s been incredibly difficult to arrange delivery to our flat as delivery companies only want to deliver during the day - when we’re at work. Chris & Emma: hands down it goes to Boak and Bailey for their entertaining and educational Brew Britannia. Well researched and written in a compelling style of prose, we feel that our knowledge of British brewing history has been enriched by this book. An honourable mention to Michael Tonsmeire for his excellent book American Sour Beers, which I’m (Chris) currently reading and finding very, very useful. Chris & Emma: For us, The Beer Diary/Chris Hall Beer has been the consistently best UK beer writing blog, it covers a wide range of topics related to beer and it pulls no punches. From a brewing perspective, Port 66 has quickly come through as the “go-to” resource for advice on a range of subjects although we often find ourselves going back time and time again to Michael Tonsmeire’s the Mad Fermentationist blog as we experiment more and more with different yeast and styles of beer. Honourable mentions to Total Ales for Matt’s bravery in tackling controversial subjects that often split beer fans, and for Richard Taylor’s superb journalistic piece on Brewmeister. Chris & Emma: Twitter, without which we wouldn’t be able to connect to the whole wonderful world of beer. Chris & Emma: Chris ‘zero tolerance in 2014’ Hall (@ChrisHallBeer), with runners up Dave Bishop (@broadfordbrewer) for his Twatterdoodles, and Matt Curtis (@totalales) for his world class Vines. Chris & Emma: Brewdog, for showing everyone else how brewery social media should be done. Again. Chris: The Thornbridge Sunday Session at the Draft House on Charlotte Street. While both the Weird Beard and Lervig sessions were also good, every single beer and food match at the Thornbridge event were sensational with my favourite being the Raspberry Imperial Stout and the pigeon. Simply incredible. Kudos to that wizard, Max Chater, and his team for turning out such well considered and executed pairings on the day. Emma: When I think of beer and food pairings I cannot see beyond the magic of the Draft House Sunday Sessions. Each one I’ve attended has been a fantastic, rewarding event which left me with a warm fuzzy afterglow. But I tend to agree with Chris that the Thornbridge event was just in the lead. Every course was great but my favourite was the dessert pairing of Otto (a weizenbock) with a banana cake, banana crisp and sugarwork PLUS a gin grattachecca (shaved ice and gin). Wow. I want it again right now. I had no idea that banana, caramel and gin would work so well together. What makes Indy Man Beer Con a great beer event? Last year we attended all the sessions bar one at IMBC. 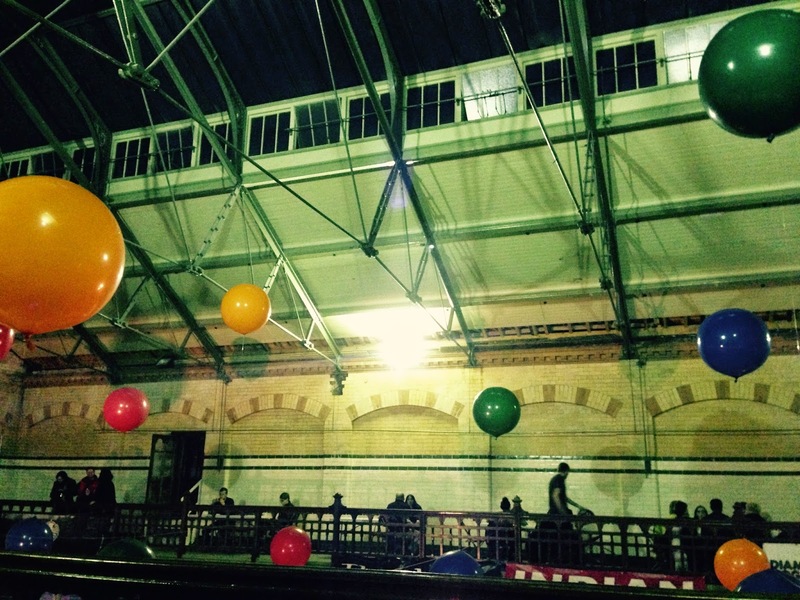 We had an incredibly positive experience there - the venue, the food, the beers (OH MY! THE BEERS! ), the organisation, the people... so as soon as the tickets went on sale in April for IMBC14 we immediately booked for the full all-sessions experience. No way did we want to miss out on what, to us, was easily the best beer event we'd ever attended in the UK. It was a Sunday in June and we were nursing the faintest of hangovers from attending the BrewDog AGM the previous day. We needed a calm, peaceful atmosphere, comforting beer and restorative food. Luckily for us Six Degrees North was a short walk away. This place is perfect in so many ways, from the wonders of its delicate and delicious in-house Belgian style beers to its soothing lighting and the absolutely ideal volume of the background music. 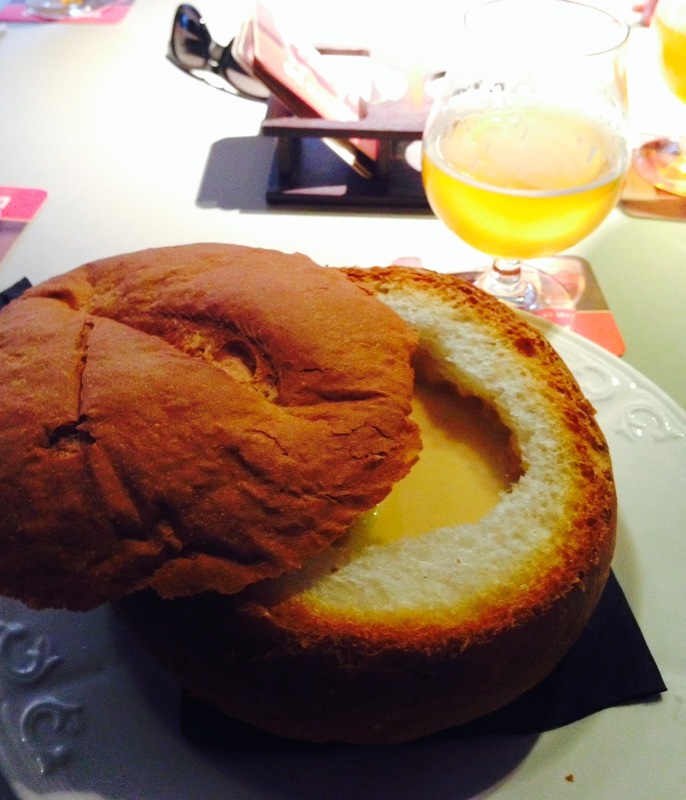 But the most magical thing about Six Degrees North on this specific occasion was its beer and cheese soup, which arrives served in its own bread trencher. You need to eat this. Take my word for it. The word is amazing. Everyone should go there simply to try the soup, and that's before you even get round to their impressive beer list. When we got home we were keen to make a version of this soup for ourselves. I trawled the internet looking for a suitable base recipe and settled on this one as a good starting place. Now here is my first pro-tip for you: select your beer very carefully. Over the years I've heard conflicting views on how to use wine in cooking. Some people say use any old thing because it doesn't matter and you don't waste the best stuff in food as you won't get to truly appreciate it. Other people say, don't put poor quality ingredients in if you want to make quality food. Personally, I have veered from one extreme to the other. For our first beer and cheese soup, I chose poorly. I figured it would be fine to use up some Dark Star Belgian IPA we had leftover from a case (which we'd been given as a prize in a brewing competition earlier this year). But, it wasn't fine. Not at all. Upon initial tasting of the soup all of the expected cheesy-herby-seasoning type flavours were there up front, followed by a slight bitterness (you just have time to wonder if this is from the beer), then WHAMMO! in the finish came the awful acetone tang across the tongue which poisoned the whole thing. That's right, I'd ruined my soup by using a beer that contributed an overwhelming taste of nail polish remover. It was an incredibly sad moment because it was clear that the soup would have been great if it had only been made with decent beer. Still, a vital lesson had been learned. 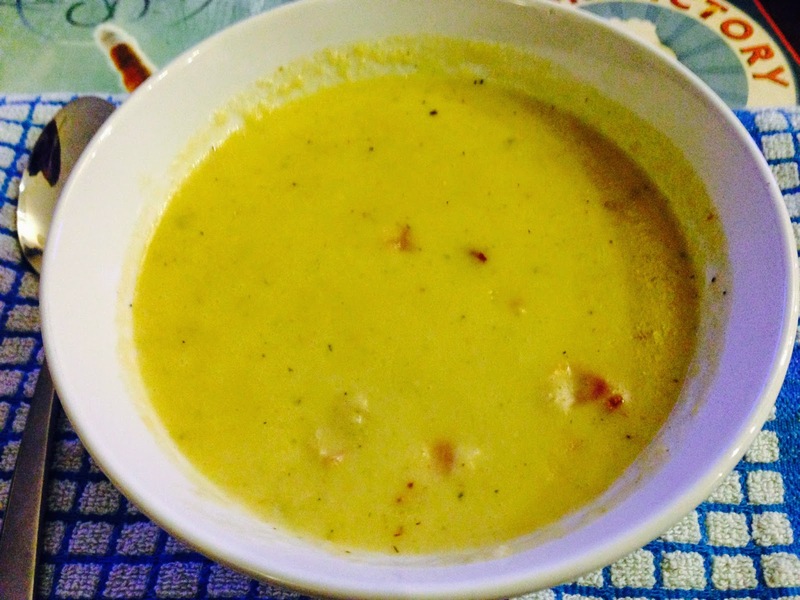 A few weeks later I came across this recipe (from Deschutes Brewery in Oregon) for Bacon and Beer Cheddar Cheese Soup and I needed to give it a try to exorcise the demons of the poisonous acetone soup. My second pro-tip for you: choose some fancy schmancy bacon. Those packets of luxury/wood-smoked/lovingly-somethinged-by-hand bacon that your eyes skim across in the supermarket before you pick up your usual pack: get that. Yes, that's right, you need craft bacon* for this recipe. But which beer should you use? Well, it's up to you really. This particular recipe called for a golden ale but I used a pale (Adnams Ghost Ship) and it worked fine. Probably you could use whatever you like and you'll achieve mild variations in flavour depending on your choice of beer (in fact, it would be interesting to use a Belgian beer... but for me it's still too soon after the acetone soup). By all means experiment! However, please do not use out-of-date beer or, in fact, any beer which you would not happily drink a glass of; that road will lead to misery. My third pro-tip concerns that all important element of the craft experience: blending. The original recipe doesn't call for any blending/liquidising of the ingredients. But again personal preference gives you the option of creating an ultra smooth soup or more chunky chowder - or anything in between. If you'd like it super smooth you could put the basic soup ingredients (onion, garlic, chilli, celery) into a food processor before frying them. If, like me, you prefer your soup to be generally smooth but a little on the rustic side then cook the vegetables, add the first portion of beer and the stock, then either give it a blitz with a hand-held blender, or if you don't have one, pour everything into a blender/liquidiser and give it a quick blast before returning it to the pan. Get it to the consistency you're happy with before adding your roux. A couple of other handy hints - be careful about your conversions from US to UK measurements. The first time I used the Deschutes recipe I made a roux with 4oz of flour/4oz of butter. When I added this to the soup the entire thing insta-solidified, like a cheesy cement. Whether this is a positive or a negative depends on how thick you like your soup. With that much thickening power it's more like a chowder, which is nice if you like chowder. The next time I made it I used half as much for the roux (2oz flour/2oz butter) and it turned out much more like a soup. 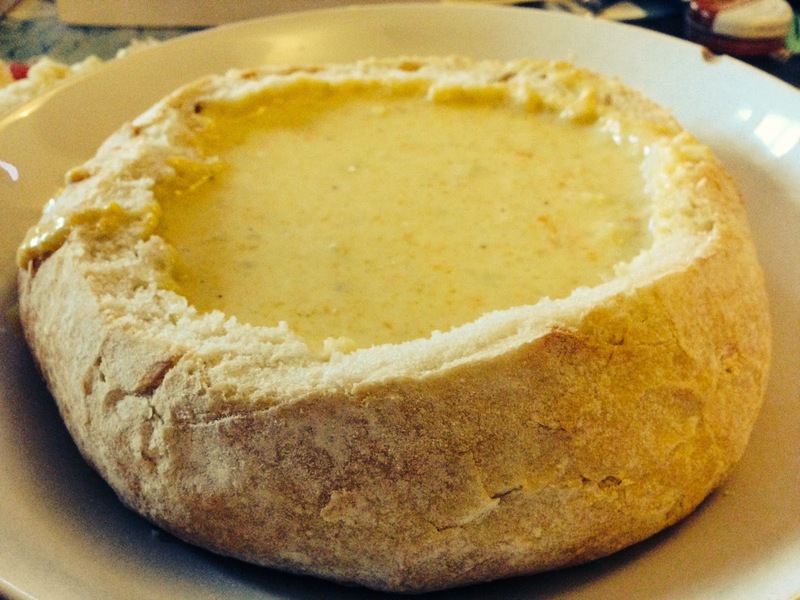 Finally, I know it's a cheese soup. I love cheese, I really do... however, I think the amount stated in the ingredients list is an epic overkill. I put the full 4oz of smoked cheddar** but only about 100-150g of standard grated cheddar - I wanted it to be a soup not a cheese fondue. But I think you should all experiment and find a version that makes you happy. *probably it will be just as delicious with standard bacon, but why take the risk? My first experience of drinking beer cocktails was in BrewDog Glasgow in 2012. As soon as we arrived I spotted a board with a list of three beer cocktails and got a bit excited. I loved beer. I loved cocktails. Surely a beer cocktail could only be better than the sum of its parts, right? My drinking companions quickly talked me down and insisted that we have a couple of rounds of beer first to work our way up to the cocktails. Eventually I got my way though and we tried one of each cocktail. Now, I don’t recall exactly what they were called or precisely what was in them (I know mine was made with Punk) but one thing they all had in common was that they were decidedly less pleasant than any unadulterated BrewDog beers. My friend Vanessa described hers as tasting like ‘old ladies shoes that have been kept in a cupboard for a long time’. We didn’t want to finish them and went back to beer instead. For those that follow us on Twitter, you've probably noticed that we've come a long way from home-brewing with a big stock pot and some plastic buckets. As we've accumulated more kit and refined our brewing process, we felt it was time to share our experiences with the home-brewing world. At least it does according to this blog post which was published a year ago. Yes, that's right - in 2013. Until I began writing this post I had no idea that a person (male or female) going for a drink by themselves was such a big deal. But there are hundreds of websites, blogs and forum posts, where people ask for and give advice on the topic. But what is even more surprising to me is that the old-fashioned concept that 'women shouldn't go to pubs or bars by themselves and if they do it means they are only there for one reason*' is still being voiced today by women. 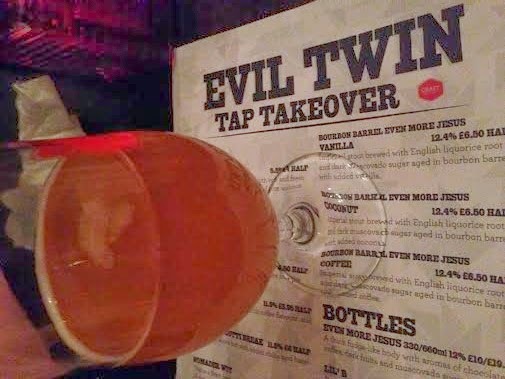 The Evil Twin tap takeover held at Craft Beer Co in Clerkenwell back in January was probably the first time I've ever bought a round of three 1/2 pints and only got 50 pence change back from a twenty pound note. That was the moment that crystallized for me how ridiculous it is to sell (one-off or unusual) high ABV beers without offering them in 1/3 of a pint measures. I think any success is always relative... but it tends to come down to process and refinement and repetition of that process. A lot of process is driven by your equipment - working out what works with your kit, which elements require particular thought and where you have weaknesses that you need to hide. I have a three-vessel setup with a 25-litre Electrim boiler as an HLT, a converted 45l Igloo cooler as a mashtun and a Brupaks boiler as my kettle, with a copper immersion chiller to handle my chilling. That setup makes complicated mash schedules a bit more difficult, and as I don't have a hopback or any way of achieving a whirlpool, I've had to experiment with adding late hops at flameout or during the chilling process to see what gets the best results. The brewday usually starts as early as I can wake up these days, after some ill-advised late night brewdays that ended up finishing at 5am. The night before, I'll weigh out the grist and keep it covered in a fermenting bucket. I've started using Beersmith to calculate my strike and sparge water, so I'll fill the HLT with whatever it tells me to and add CRS as required. In the past, I didn't bother calculating the water, which has led to a lot of over-collection of wort or efficiency issues. I've learned from those mistakes. HLT goes on while I make a bacon sandwich and a pot of coffee and review the hop additions, then add the water and grain to the tun together, adjust the temp with tap or boiling water as required, and set a timer (I usually do 90 minute single infusion mashes). About 15 mins from the end, I'll refill the HLT and set it to heat up, so that by the time I need to start sparging, I'm at about 75-80c as required. I vorlauf until I get bored of it, if I'm honest - I rarely see clear wort even if I do this for half an hour, so I usually recirculate about 20-25 litres and then start taking runnings slowly. I don't have any fancy equipment for distributing sparge water - I use a sheet of tin foil with holes punched in it with my thermometer. Really rudimentary stuff. I've always sparged very, very slowly, a relic of my first all-grain brew which had loads of oats in it - on the plus side, I've had decent efficiency since. Any time I've sparged quickly, I've ended up with disappointing efficiency, and brewdays are far too much effort to ruin them for the sake of cutting 20 minutes off a sparge. I collect in a marked fermenting bin as my boiler doesn't have a sight glass, then I jug it over, reserving a sample jar to test the pre-boil gravity once it's cooled to a reasonable level. I don't have a pH meter or a refractometer, but those would be my next investments - at the moment, I tend to repeat last-known-good processes and malt bill, or try to correct the process based on identifiable faults in the end product. The next investment will be in a pH meter, definitely. At the end of the boil, I try to chill to 24c as quickly as possible using the coil, then drain through a wire mesh hop filter inside the kettle and into an FV. The drop into the FV and associated aeration usually takes the last couple of degrees celsius out of the wort, ready for pitching. My fermentation room keeps a constant 18c, even in summer, so I use a heatpad for driving up the temperature for Belgian yeasts and a fridge for lagering. I rarely go straight from primary to packaging - only with something like a Belgian witbier, where a bit of yeastiness is acceptable and I'm not bothered about clarity too much. A bit on dry-hopping... almost everything I brew is dry-hopped, usually just dropping pellets into the secondary. Occasionally they go into a muslin bag if I'm being very cautious about clarity, but otherwise I just crash-cool to get rid of all the pellets before bottling. That said, I remember one beer I bottled with lots of matter still in suspension, and they were all horrific - gushing, infected, nasty bitterness... grim. One last thing: record everything. If your brew goes well, you'll want to do everything again in exactly the same way. "What do you put your brewing success down to? Is it being able to put together a good recipe? Is it your brewing process (your equipment, your method of working, etc)? Is it your overall understanding of what you are actually doing, which allows you to problem solve by first principles as you go along (rather than just following instructions by rote)? Or something else?" First and foremost I put in down to a willingness to listen and learn. I started out with no clue as to what I was doing and I’d assert that this is the same place all brewers start so you’re not at a disadvantage. Some may have a natural flair for recipes but without a grasp of the basic science behind it and the process required they won’t be able to put those ideas into motion. I started out by reading John Palmer’s How To Brew and found it completely overwhelming at first, especially when it got into detail. So then I started reading blogs such as David Bishop: broadfordbrewer to see how others were applying the theory in a practical sense. This was an iterative thing before eventually plucking up the courage to take the plunge. For me, the most important learning has been ‘on the job’. Books get you to a point and often help provide answers when things don’t turn out right but by far the best way to learn is to do. I’ve had some disastrous brew days but you get through them and bring a bit more experience to the fold each time you fire up your trusty HLT. The basic process has remained the same but I’ve refined things in terms of approach and equipment as I’ve progressed. My first brew was boiled up in a stainless pot on our electric hob and cooled in a garden bucket. The brew day was very long because everything took much longer than it needed to. I’ve invested in kit to help improve the process and reduce the length of brew days especially. The biggest win was an electric HLT/kettle that shaved off over 2 hours! Also worth noting here is my approach to temperature control. Until very recently I didn’t do anything here beyond wrapping blankets around the FV when it was cold and finding a cool part of the house when it was warm. The key thing was to pick yeasts that were happy with the temperatures within which they had to work. Yeasts such as Wyeast 1056 (Chico - see also Fermentis US 05) and 3711 (French Saison) work very well at room temperature. My first brews with specific yeast strains that like to work at warmer temperatures dictated the need to buy a heater plate more recently. My advice to home brewers starting out is to get your basic process and especially sanitation sorted out before starting to worry about complicated temperature controlled set ups. Don’t run before you can walk. My second bit of advice when it comes to fermentation would be to have patience! I’ve done this once before with an ESB. It’s not a style drink too much of but one I wanted to know how to brew. I didn’t even bottle any - just tasted it, let it sit there for a while, tasted it again then poured it away because I needed the fermenter back. That’s not something I can see myself doing too often! I’d like to try a decoction mash at some point and would also like to expand my knowledge of brewing with wild yeast strains, even though the beers the styles of beers implied there are not my favourites. Sometimes my brewing is (in my opinion) pretty good, sometimes it’s not. It’s all because I wish to experiment, and learn so quickly. I started out having little clue as to what I was doing, using a brewing application, and mashing in a bag, in a coolbox and boiling in 3 pans on the stove. Very quickly I grew unhappy as I didn’t fully understand the things I was doing. So I started to build my spreadsheet up and learn from first principles how everything works. Most of my understanding, and I suppose fun, comes from the equations and numbers. That’s something that I spend more time working through. Since then I’ve moved to bigger cool boxes, and from there to a converted keg mash tun/ kettle (this was meant to be a separate MT and kettle, but for now is a single keg used to do both) that I made myself. I will be making a new keg MT and kettle when I can either find another local brewer with damaged kegs, or I can afford to buy some for use.